Reminiscences aside, if we weren’t paying attention to election campaigning in Zimbabwe, we sure are now. All of our attention had been on the critical issue of electoral reforms: the printing of ballot papers, the availability, detail and accuracy of the electronic voters roll and then BANG, everything stopped when there was an explosion at a Zanu PF rally in Bulawayo last weekend. Despite the large number of security personnel surrounding President Mnangagwa and the VIP’s, somehow there was an explosion at the edge of the podium which went off moments after President Mnangagwa left the stage. Theories, gossip, speculation and whispers abounded; again and again we watched the video clips on social media but were only left with even more questions: what, how, who, when, where? Later in the afternoon of the explosion President Mnangagwa told ZBC reporter Reuben Barwe that he thought this was probably his “usual enemies,” but didn’t name them, and said it definitely wasn’t undertaken by people in Bulawayo because they loved him, and he also loved them. Eyebrows went up. In the days that followed we heard that two security personnel had died from injuries sustained in the explosion in Bulawayo and more than forty people had been injured. A few days later BBC reporter Fergal Keene asked President Mnangagwa if he knew who was responsible for the explosion. Mr Mnangagwa said evidence was being gathered but his hunch was that it was “a political action by people aggrieved with the new dispensation,” people known as the G40, who were allies of Mrs Mugabe. 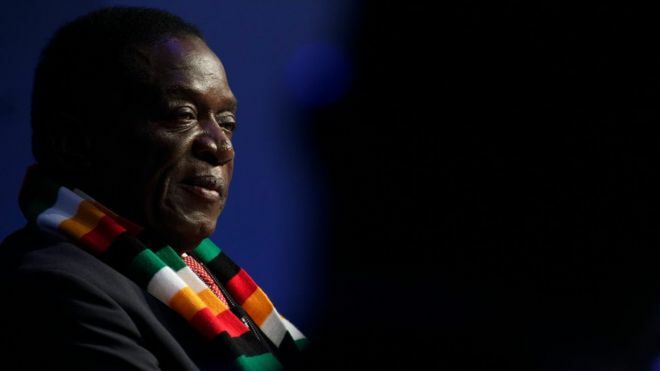 Asking Mr Mnangagwa if he had the characteristics of the crocodile (Mr Mnangagwa’s nickname), those of being patient but ruthless, Mr Mnangagwa replied that he was “as soft as wool.” Again eyebrows went up, even those of Fergal Keene, who said he thought Mr Mnangagwa was as tough as nails! The BBC reporter asked Mr Mnangagwa why people should believe that he had changed seeing as he had been in the Mugabe government and cabinet throughout all the years when people were being beaten and tortured. “You were part of it,” Fergal Keene said to Mr Mnangagwa who responded by saying that people should look at his actions now and not at the perceptions they had of him. Mr Mnangagwa gave two examples of his actions now: removing police roadblocks and opening political space to 130 political parties in the country. Removing police roadblocks and allowing a mushrooming of political parties is a far cry from real democracy; a far cry from the justice and accountability that is so desperately needed in order for Zimbabweans to put forty years of human rights abuses behind us. Despite the President’s charm offensive to the world, they are not the ones who will be dropping ballots into boxes on the 30th July, we are. President Mnangagwa may describe himself as soft as wool but our memories, losses, scars and nightmares at the hands of 38 years of Zanu PF governance are very fresh. Like the hair in my sheep’s wool, you can’t make a fine carpet when the wool is tainted.